You know when you hear a song and the lyrics really speak to you? We believe there’s a soundtrack to every situation and these songs describe our travel feels perfectly. Which of these tracks speaks to you the most? Feels: When you’ve had enough of your job. Routine, eurgh! You are itching to see the world. Feels: You’re trying to remain calm and hold it in, but you really really really wanna zigazigah go travelling! Feels: Stay positive, keep saving and chasing that travel dream. Feels: You want to book that adventure ASAP but your bank balance is not having any of it! You need these top tips on how to save money for travel. Feels: Your parents/mates aren’t too keen on your decision to fly the nest (again!) But it’s your choice, it’s your life. If it’s what makes you happy then GO FOR IT! Feels: Don’t let anything or anyone hold you back. Turn that bucket list into a booked it list! Feels: When you finally book that dream trip and you are beyond excited! It’s happening. The travel dream is becoming a reality. Feels: It is happening, the day has arrived. You are heading to the airport and your dream trip is about to begin. Feels: That feeling when you land in a new country. The excitement hits you. You’re about to start a new adventure and make unforgettable memories. It’s simply the best feeling. Feels: When you check-in to your hostel. There are all types of interesting characters from all over the world, all under one roof. Some will become your friends for life, others will provide entertainment, stories or tips that can shape your travels. Whatever happens, it will be a lot of fun getting to know everyone. Feels: The lyrics say it all. 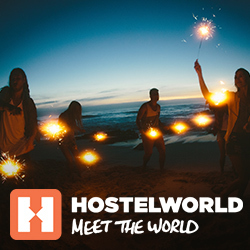 You’ve found your passion and you’re having the time of your life backpacking around the world! Feels: You’re in love with the new place you’re exploring. You thought you couldn’t beat the previous adventure, but it just gets better and better! Feels: You’re having an amazing time on your travels and you don’t want it to end. You’re not ready to go home at all! If this is you, you should look at these jobs that allow you to live the dream and travel the world! Feels: The travels are over for now. You’re back home after an unbelievable experience. You literally had the time of your life. Feels: Admit it, you’ve got the travel bug, bad! You can’t stop telling people about the amazing time you had and showing them your 15,267 photos! Feels: You got so used to sleeping in a dorm with your mates that it now feels way too quiet in your own room! You miss the hostel life and your travel buddies. Feels: You really really miss your backpacking days and you need another trip ASAP. Feels: You’re getting feisty now and demand more travel! Feels: The travel blues have hit you! But don’t worry, we have 10 steps to conquer them. Feels: Tinchy says it how it is. Get yourself back out there. The post Now that’s what I call travel: Song lyrics that perfectly describe our travel feels appeared first on Hostelworld Blog.